The iBall 5.1 booster speakers are ideal for people who want to enjoy the ultimate listening experience. Stream music wirelessly through any Bluetooth enabled device. Advanced Bluetooth 4.0 technology – High quality audio transmission. These speakers focus on optimising the quality of audio. Incorporating a high-power output and a low-distortion circuit, the iBall booster 5.1 speakers specialise in minimising the external interference to improve the quality of audio that is being delivered. Additionally, the iBall speakers come with a fully functional remote that makes it easier for you to operate the entire system. 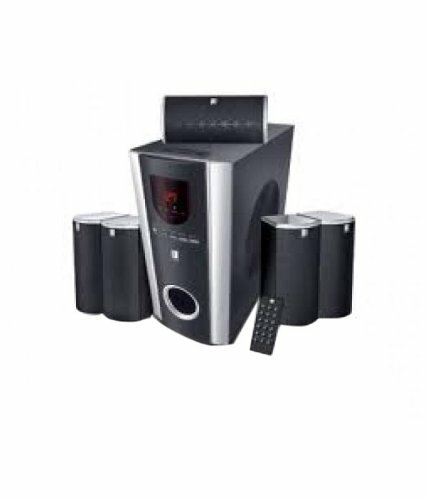 Ideal for commercial as well as residential premises, the iBall speakers incorporate a 5.1 channel configuration. Thanks to the wooden chassis, the 5.1 speaker system look very classy as well as elegant adding a tint of glamour to the aesthetic appeal of the room. The wooden finish also ensures that the quality of the sound is enhanced giving you the best every listening experience with the powerful iBall booster speakers. Furthermore, the system come with a clear LED display that indicates which track is currently played. This LED display also provides you with details regarding the volume levels and the settings and modes being used. The 5.1 speakers come with one subwoofer that helps in reducing the unwanted noise to give you unadulterated sound. With a high signal-to-noise ratio, this iBall speaker system works excellently well when it comes to removing the impurities from sound. Additionally, the combination of satellite speakers with subwoofer ensures that the iBall USB speakers can amplify even the tiniest beat to give you a wonderful listening experience. Furthermore, the iBall 5.1 speakers are magnetically shielded to prevent other signals from interfering with the sound output. So you can safely place them next to your TV.